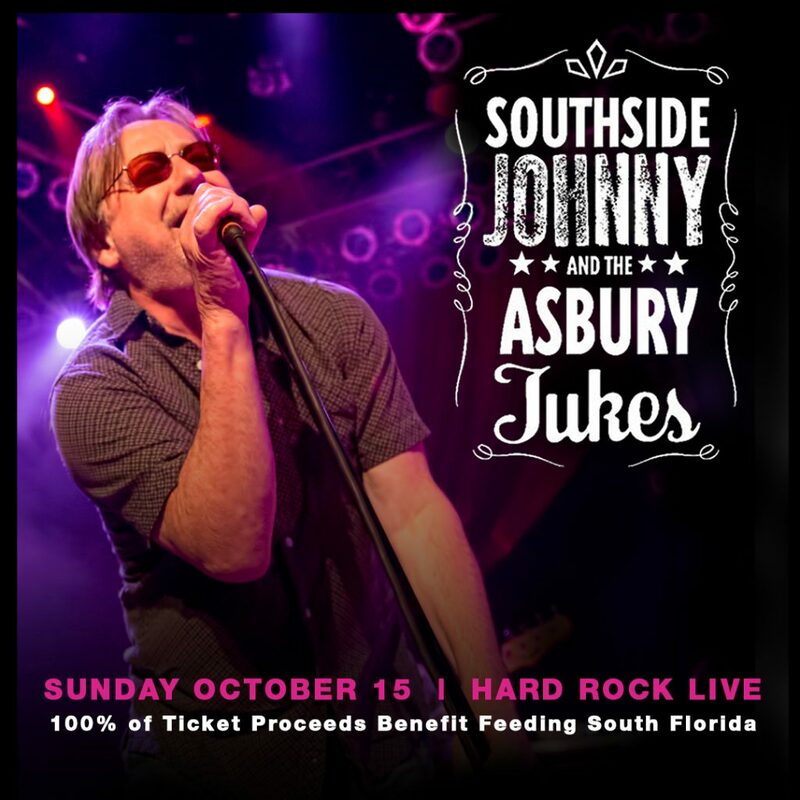 The Godfather of “the New Jersey Sound,” Southside Johnny and the Asbury Jukes will perform a benefit show at Hard Rock Live Orlando on Sunday, Oct. 15, 2017, at 8 p.m. Tickets are on sale now and can be purchased from the Hard Rock Live Box Office at 407-351-LIVE (5483) or on Ticketmaster. To give back to the Florida community following Hurricane Irma, 100 percent of ticket sales will be donated to Feeding South Florida®. By partnering with Feeding South Florida, Hard Rock Live Orlando’s donation will help the organization’s hurricane relief distribution efforts, ensuring water, meals and other non-food supplies are getting to those most in need of assistance. Feeding South Florida works with direct-service programs and a network of non-profit agencies, including soup kitchens, food pantries, homeless shelters, and more. For more information, visit www.hardrock.com/live/locations/Orlando. Feeding South Florida® is a member of the Feeding America® network of food banks and the leading domestic hunger-relief organization serving Palm Beach, Broward, Miami-Dade, and Monroe Counties. Our mission is to end hunger in South Florida by providing immediate access to nutritious food, leading hunger and poverty advocacy efforts, and transforming lives through innovative programming and education. Feeding South Florida rescues 46 million pounds of food annually, serving 710,370 individuals in need of food assistance — 248,080 of whom are children and 120,000 are older adults. Feeding South Florida is the largest and most efficient food bank in each county it serves, providing for 25 percent of the state’s food insecure population, through a local network of nearly 400 nonprofit partner agencies and direct service programs. For more information, visit www.feedingsouthflorida.org or call954.518.1818. With venues in 74 countries, including 178 cafes, 24 hotels and 11 casinos, Hard Rock International (HRI) is one of the most globally recognized companies. Beginning with an Eric Clapton guitar, Hard Rock owns the world’s greatest collection of music memorabilia, which is displayed at its locations around the globe. Hard Rock is also known for its collectible fashion and music-related merchandise, Hard Rock Live performance venues and an award-winning website. HRI owns the global trademark for all Hard Rock brands. The company owns, operates and franchises Cafes in iconic cities including London, New York, San Francisco, Sydney and Dubai. HRI also owns, licenses and/or manages hotel/casino properties worldwide. Destinations include the company’s two most successful Hotel and Casino properties in Tampa and Hollywood, Fl., both owned and operated by HRI parent company The Seminole Tribe of Florida, as well as other exciting locations including Bali, Chicago, Cancun, Ibiza, Las Vegas, and San Diego. Upcoming new Hard Rock Cafe locations include Phnom Penh, Cairo, Cape Town and Chengdu. New Hard Rock hotel, casino or hotel-casino projects include Atlanta, Atlantic City, Berlin, Budapest, London, Los Cabos, Maldives, New York City, Davos, Ottawa, Dalian and Haikou in China. For more information on Hard Rock International, visit www.hardrock.com.